~Did you know God speaks His love for you through every single story in the Bible? He knew you from before He created the world, and He has good plans for you - yes, He even sings songs pver you with rejoicing! 18 Bible stories frome Creation through to the Ascension unpack these wonderful facts and give each child the possiblity of learning that they are precious beyond measure in God's sight. Each Bible story is backed by carefully chosen and well-known Bible verses emphasizing the truth in each story. 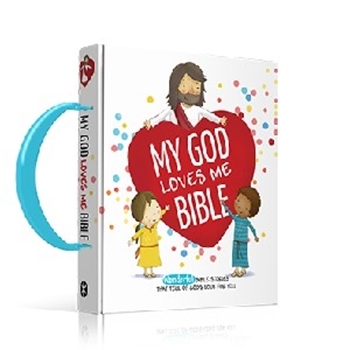 Together with the heartwarming illustrations, these stories will give children a firm understanding of the message of the Bible so they can confidently say, "God Loves Me" and know why, too!